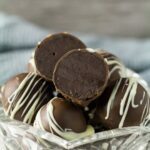 Chocolate Coffee Truffles – These deliciously rich and creamy chocolate truffles are infused with coffee, and sealed in a smooth chocolate shell! Chocolate and coffee is such an indulgent and delicious flavour combination, don’t you think? That’s why I’ve upgraded my Easy Chocolate Truffles and thrown in some coffee. 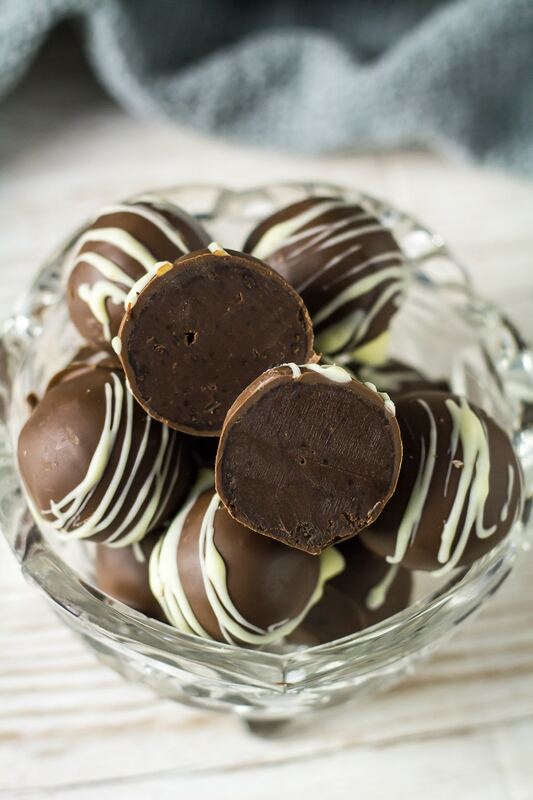 I bring you these totally irresistible Chocolate Coffee Truffles! These truffles are rich and super creamy; they’re loaded with coffee flavour, and generously coated in even more chocolate. Coffee lovers – you are gonna love these. Chocolate: You can use milk, dark or semi-sweet chocolate here. Make sure to use the best quality chocolate that you enjoy eating on its own. Instant coffee granules OR powder: Be sure to use your favourite instant coffee – flavour is everything in this recipe! Chocolate: Milk, dark, or semi-sweet. Coconut oil: You can use unflavoured coconut oil if desired. This is only used to thin out the melted chocolate for coating the truffles. 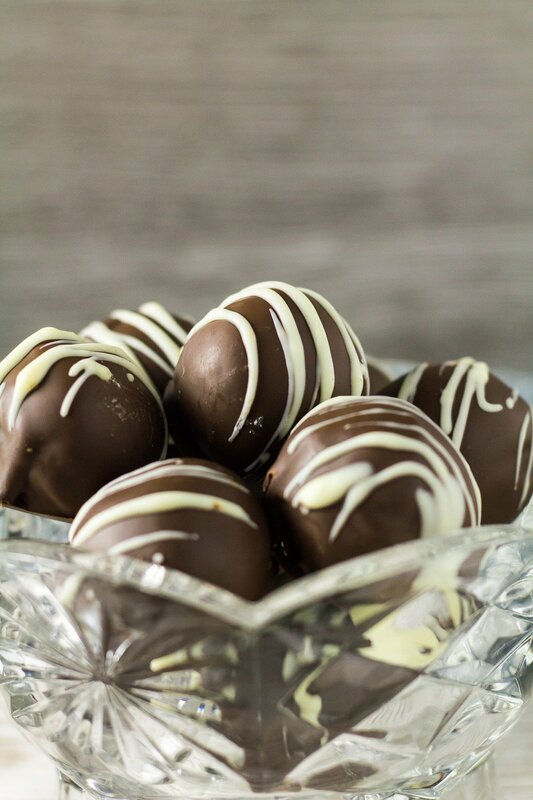 To make these truffles, simply start by adding the chocolate and heavy cream to a microwave-safe bowl. Heat in 30 second intervals, stirring after each one, until melted and smooth. Add the butter and coffee granules and stir in until completely smooth and combined. Cover the bowl with clingfilm, and refrigerate until the chocolate is firm – I like to leave mine in the fridge overnight. Once firm, roll the mixture into 1oz balls, and place them onto a baking tray lined with parchment or wax paper. Freeze the truffles for 30 minutes. TIP: If the mixture starts to become too sticky/melty to roll, coat your hands with cocoa powder to make the process easier. For the coating, add the chocolate and coconut oil to a microwave-safe bowl, and heat in 30 second intervals, stirring after each one, until melted and smooth. Dip each truffle into the melted chocolate, place back onto the baking tray, and refrigerate until set. 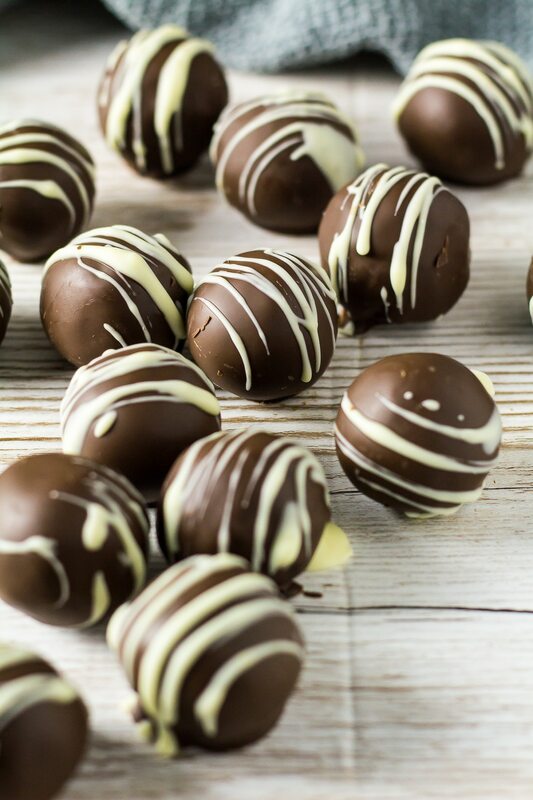 I drizzled my truffles with white chocolate – makes them look extra pretty! How long will these chocolate truffles last? These truffles can be kept in an airtight container, layered between parchment or wax paper, in the fridge for up to 1 week. If desired, let them come to room temperature for a more softer centre. Can I freeze these chocolate truffles? Yes! They freeze well for up to 2 months. Be sure to thaw overnight in the fridge before serving. Try these truffle recipes next! Stir in the butter and coffee granules until fully melted and combined. Cover the bowl tightly and refrigerate overnight or until the ganache is completely set. Line a large baking tray with parchment or wax paper. Roll the mixture into 1oz balls, and place them onto the prepared baking tray. If the chocolate becomes too sticky to roll, coat your hands in cocoa powder to make the process easier. 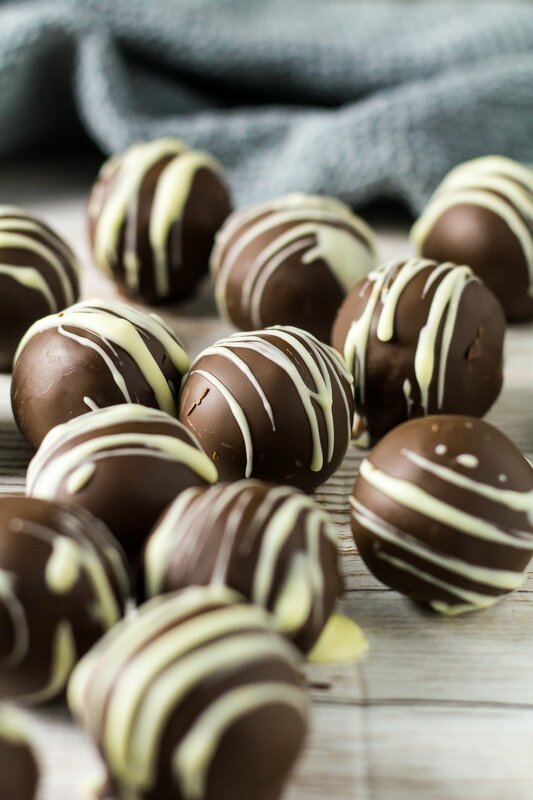 Freeze the truffles for 30 minutes. Add the chocolate and coconut oil to a microwave-safe bowl, and heat in 30 second intervals, stirring after each one, until melted and smooth. Dip each truffle into the melted chocolate, place back onto the lined baking tray, and refrigerate until set. Truffles can be kept in an airtight container, layered between parchment or wax paper, in the fridge for up to 1 week. They also freeze well for up to 2 months. Thaw overnight in the fridge. 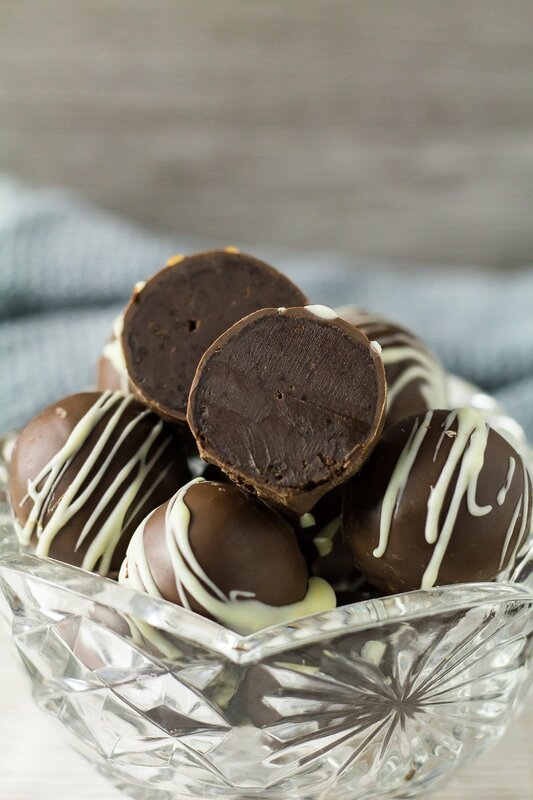 These chocolate coffee truffles are absolutely amazing! They are decadent and the perfect little treat after a long day. Cannot wait to make these again! 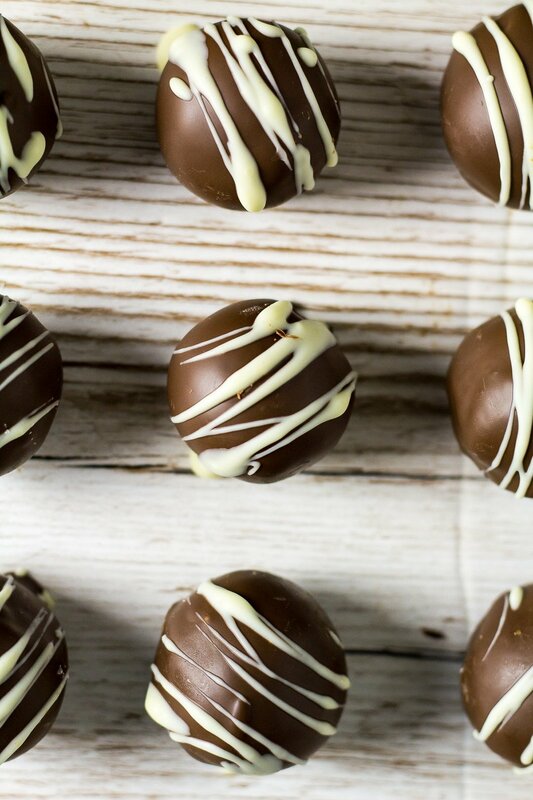 My husband loves truffles so I know what I’ll be making him this Valentine’s Day! Thanks for the scrumptious recipe!